The current vision for a seven-story complex is $58 million over the budget predicted in the 2017 bond request to voters. The new vision for Lincoln High School calls for a seven-story tower of academic classrooms and teaching space. A center courtyard will separate the tower from a three-story theater and a gym above an adequately sized (finally) cafeteria. Inner Southwest Portland's Lincoln High is densely packed with 1,700 largely high-achieving students. Complaints of the small, inadequate cafeteria have been a frequent rallying cry for the Cardinals community. The inner city school is scheduled break ground on its new building in 2020, to open for the 2022-23 academic year. The building is still envisioned as a 289,000-square-foot plan with 206,000 square feet as instructional space. Fourth through seventh floors: classrooms and flex spaces. The top floor will likely house the art and science classrooms for maximum ventilation. Designers have had to make cuts as Lincoln's cost estimates are coming in way over budget. 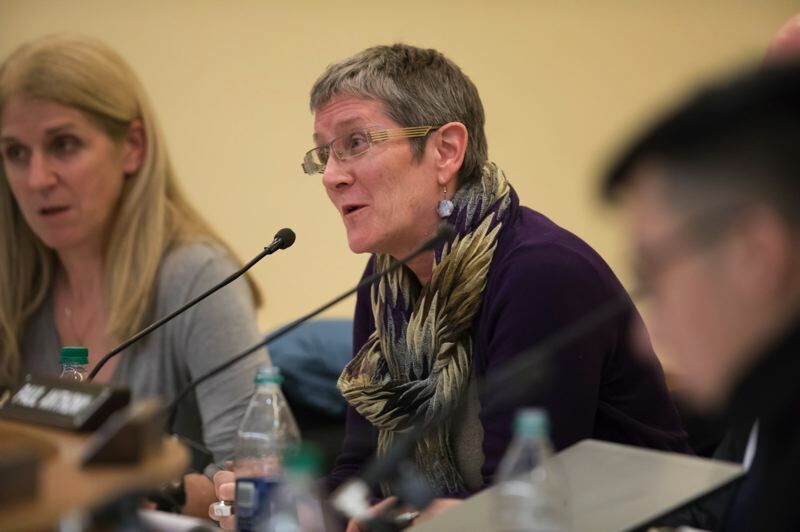 BORA architects are starting to draw up detailed schematics, but presented their broad strokes to the Portland Public Schools board on Tuesday, July 17. Their plan could cost as much as $245 million. * That's a huge increase from the $187 million in the request to voters last year as part of a $790 million bond. "I'm still suffering from sticker shock here and I still don't understand where the discrepancy happened," said Rita Moore, newly elected board chair. "It would be very good to know that," board member Paul Anthony echoed. "(And to know) if all of these increases are necessary. And that the hemorrhaging on our poor bond will stop with these." "When we talk about these really big numbers, it's hard to answer," Senior Director Dan Jung replied. He deferred questions on cost comparisons until his team could put together detailed numbers and reports for the board and the public. The new school will be built at the western end of the site, where the edge of the athletic fields are now. During the two-year build, students will still attend classes in the old building. After that, the new track and field will be installed where the old building is now. So, Lincoln High will be mostly without on-site athletics for three years. As the only PPS high school in the downtown core, construction is complicated and costly. The Central City 2035 plan recently added $1.74 million in extra costs to meet new code requirements, according to Jung. But PPS successfully lobbied the city for exemptions to some of the Central City 2035 code requirements. For example, Lincoln will still offer 100 staff parking spots. Moore, who said she used to take the MAX to work downtown, said she thought those parking spaces might be better used as something else. "We keep talking about what a constrained space this is," she said. "Yes, it would be a sacrifice for staff at Lincoln (to not have parking). It's a sacrifice for anyone who works anywhere downtown." Board member Amy Kohnstamm, who has been spearheading the Lincoln rebuild process, said the neighbors would be upset. "The neighborhood issue is not insignificant," she said, noting the increasingly difficult parking situation in the area with new high-rises all around. Lincoln project manager Erik Gerding, who has been in negotiations with the Goose Hollow Foothills League, agreed. As currently envisioned, the Lincoln High School building will have 169 square feet per student, about a 60 percent increase in space per child. That's less than the other five rebuilt high schools, except for Franklin High which has 162 square feet per student. All of the high schools are being designed to house 1,700 students. The Lincoln design team worked in a few special requests for types of space, the largest being a half-sized wrestling room. There will also be extra arts and music spaces, a large hall for Model United Nations and Constitution scholars to practice, and a suite of tiny interview rooms for International Baccalaureate candidates. But the classrooms and library will be smaller than the original plan. Designers also slashed the number of teacher planning spaces and axed an early idea for rooftop tennis courts when Portland Parks & Recreation couldn't bring money to the table. Another constraint for the design team is two invisible streets on the property. Southwest 16th and 17th Avenues' utility lines continue through the property, so PPS can't build on top of them. 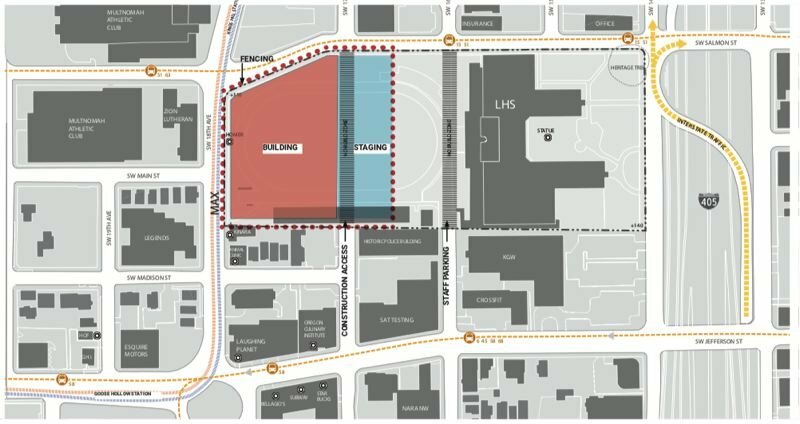 As a small, urban site, Lincoln will have more limited athletics facilities than its counterparts. 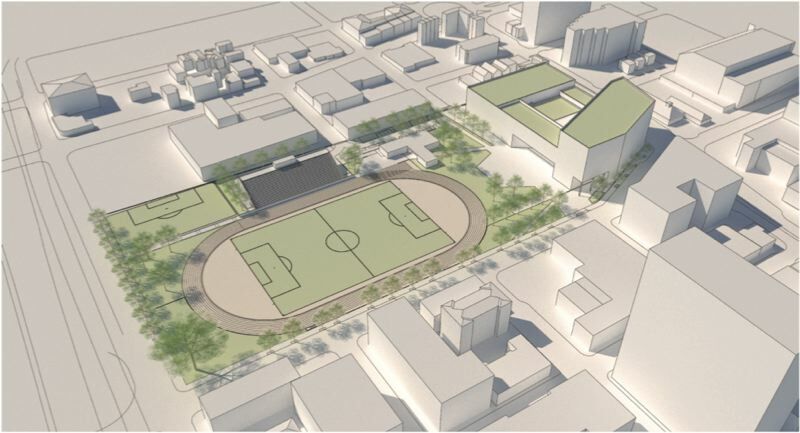 But the plan still wedges in a track and soccer field, a practice field, batting cages and the wrestling room, as well as a gym and a multipurpose space for dance and yoga. The seven-floor classroom tower will be accessible through stairs and four elevators. Designers said the "wide span" areas — the gym, the theater, etc., will be built strong enough to house people after an earthquake or other major emergency. According to the school's website, Lincoln High School was the first public high school in the Northwest when it opened in 1869 as Portland High School. It has moved several times since, until, in 1952, the school moved to the red brick building on Southwest Salmon Street. • $1 million PGE requirements for electrical access. • $1.6 million for increased steel prices, in part due to tariffs from the Trump administration. • $1.74 million for things like a 60 percent green roof and bird-safe window glazing, now required by the Central City 2035 plan. • $7.4 million to mitigate the unknown fill covering Tanner Creek, below the site. The pilings to support Lincoln's seven-story structure will need to be 95 feet or more. • $42.6 million is categorized as "mark-ups," such as newly calculated contingency, inflation and escalating costs in a hot construction market. The design team did present several million dollars' worth of savings options, though many would result in higher operating costs. UPDATE (7/19/18): The new Lincoln's total square footage is 289,000 square feet. An earlier version gave the total for instructional space.